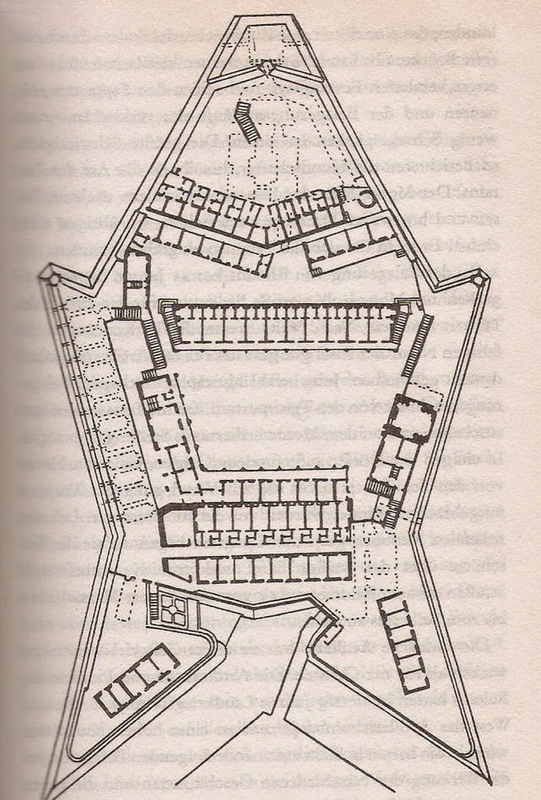 Plan of Fort Saint Elmo. In the letters that la valette dispatched day after day to Sicily and the Italian mainland, he never failed to stress the strategic importance of Malta. Its loss would leave Christian Europe as “a fortress without a ravelin.” The metaphor was not wasted on his audience. Since the fall of Constantinople, the technical language of Italian fortress engineering had been constantly on the lips of Christian potentates and churchmen. They conceived the whole of the Christian Mediterranean as a vast system of concentric defenses, at the center of which sat Rome, God’s keep, constantly under attack from the barbarian horde. One after another, the outer works had crumbled. In the years after 1453, Venice had been the outer wall of Europe; the Ottomans had neutralized it in just fifty years. Then Rhodes was the shield of Christendom. It had fallen. With each retrenchment, the Turk was a step closer. Now Malta had become the ravelin of Europe. Everyone realized the significance of this—the pope in Rome, the Catholic King high up in his palace in Madrid, Don Garcia across the water in Sicily—for when the ravelin fell, the end of a fortress was nigh. In late May and early June 1565, concern for the defenses of Christendom focused on a single point. For if the key to Europe was Malta, the key to Malta was Saint Elmo; and the fortress, in its turn, was dependent on the small makeshift triangular ravelin that protected its vulnerable side. Turgut understood this as clearly as La Valette. And he was determined to act. By the morning of June 3, following a night of intense bombardment, Ottoman troops had established sheltering positions close to the ditch and only tens of yards from the ravelin’s protecting walls. It was, by irony, the saint’s day of Saint Elmo—the patron saint of seamen. Ottoman engineers, intent on assessing the effect of the night’s barrage, slipped into the ditch in front of the fort and approached the ravelin. There was silence from the position—no challenge, no shots from a lookout. They got up to the foot of the fortification unnoticed. In all likelihood, the assigned sentry had been silently felled by a single arquebus shot, and lay on his stomach on the parapet looking “as if he were still alive.” His comrades, only forty in all, assumed he was still on guard. Other versions give a more cowardly version of the sentries’ behavior. The engineers stole away and informed Mustapha. A force of janissaries with scaling ladders crept forward and stealthily climbed the parapet. They burst into the small fortress with ululating cries and shot to death the first men they saw. The remainder turned and fled, too panic-stricken to raise the drawbridge into the main fort behind them. Only a determined sally by a small group of knights stopped the rush of the janissaries into Saint Elmo. A spirited counterattack was mounted to force the intruders out of the ravelin; two or three times they seemed to have succeeded, but more men were flooding the ditch, and the defenders were forced to withdraw. With lightning speed the Turks seemed able to consolidate their position in the ravelin, bundling in sacks of wool and earth and brushwood to construct a rampart against counterattack from the fort. Flags—the critical markers of possession—started to flutter from the makeshift defenses. It was just the prelude to a berserk, impromptu assault by the men in the ditch, who propped ladders against the walls with the hope of finally storming Saint Elmo. They felt certain of success, but the attempt was suicidal. The defenders hurled down rocks and liquid fire on the Turks’ unprotected heads. The din of the battle was extraordinary; according to the Christian chroniclers, “with the roar of the artillery and the arquebuses, the hair-raising screams, the smoke and fire and flame, it seemed that the whole world was at the point of exploding.” After five hours of havoc, the Turks were forced to withdraw, leaving five hundred crack troops dead in the ditch. The defenders claimed to have lost sixty soldiers and twenty knights, including the French knight La Gardampe, who crawled away into the fortress chapel and died at the foot of the altar. Despite the huge Ottoman losses, the ravelin was now in enemy hands. The serious consequences of the loss were felt almost at once. The Ottomans worked furiously to consolidate their command of the ravelin, using goatskins filled with earth to raise the platform until it was level with the wall. They now occupied an offensive position within yards of the fort; they were soon able to bombard its very heart with two captured guns. In the ditch below, men could work their way up to the base of the walls without being attacked Toward dawn on June 4, while the Turks were still fortifying the ravelin, a small boat was seen approaching the rocky promontory below the fort; the sentries on the rampart tensed themselves, ready to fire, when a cry rang out in the dark: “Salvago!” It was a Spanish knight, Raffael Salvago. He had been dropped by galley from Sicily with messages from Don Garcia, and had run the blockade around the harbor. With him was an experienced captain, Miranda. The two men clambered ashore and briefly inspected the fort in the dark, then climbed back on board. By now the crossing between Saint Elmo and Birgu was under threat from sharpshooters. Boats could no longer make the journey in broad daylight; even night crossings were fraught with danger. As they rowed quietly across the harbor, a volley of shot struck the boat and killed one of the crew. La Valette listened to their report in gloomy silence. It was devastating to have lost the ravelin so negligently. Hardly more reassuring was the news from Sicily: Don Garcia was struggling to gather forces but he hoped for relief by June 20. The question was simply how long Saint Elmo could be kept alive. Miranda was dispatched back again to make a more detailed appraisal of the defenses and the men’s morale. His second report was emphatic: “The fort could not be held for long if the Turks were persistent, because the lack of traverses meant that the defenders’ fire had little effect. Furthermore, there was no strongpoint to which the defenders could retire.” Yet again La Valette wanted to test this information. Another commission was dispatched specifically to study the feasibility of retaking the ravelin, with the same conclusion: “It was impossible to get the ravelin back; they should shore up the defenses for as long as they could.” From now on Saint Elmo was living on borrowed time. A nightly transfusion of men and materials slipped across the harbor, dodging the enemy guns, keeping the doomed fort alive. It was on life support.